You see that all of your teammates are dead or captured and 4 enemies are collecting their ammo as you peek through a hole in your last standing fort. It’s only a matter of time before they find you, and you have only 5 darts left in your trusty chainblazer. The time has come. The enemy has turned to watch a squirrel climbing up a tree. You charge through the remnants of your base screaming with adrenaline pumping through your veins. The enemy is slow to react as you send a deadly rain of darts at them, killing off all but one opponent. Then you remember your Larami 500 in your coat pocket and begin charging the last opponent and pressurizing the air chamber. You get in range and dive forward, launching your only dart at the enemy. You land on your face and don’t move until you hear a scream of anguish. You look up and see the enemy sink to his knees with a dart sticking to his forehead. You rise with a grim smile on your face as you go to free your teammates. Then you hear a deafening pop and feel a dart smack you so hard you fall over. The last thing you see is a sniper jumping out of his tree and his face looming over you, then red fills your vision. Hello and Welcome to Foam Warfare Central! 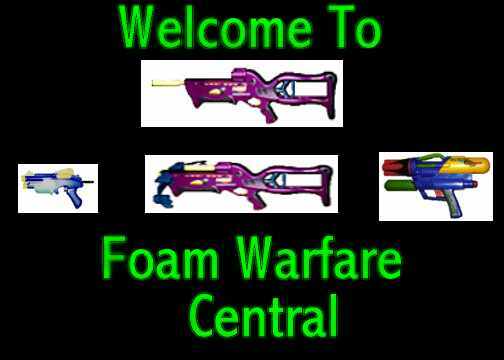 I have designed this website because of my interest in foam-shooting weaponry. Enjoy your stay! 3/8/01 Alright, here's a real update. I've added knife fighting to my tactics section, along with some aiming tips in the sniping tactics section. 7/24/00 Added a new link. Once again, war stories and other stuff would be appreciated. 5/13/00 Thought I was dead huh? So did that sniper . . . Anyways, I added a reflex skill to my RPG at the suggestion of Peter Brunton. Also I added Murphy's combat laws to the tactics section, read them or die :-). Other than that, it's spring! Get off the computer and go shoot people. Then tell me about it so my pitiful war story section beefs up! 2/6/00 I added a new addition to combos under Heavy including a heavily (no pun intended) modded ripsaw. Also I added some tactics submitted to me by the . . . colorful members of The Nerflist. 2/5/00 Well, I added some user-submitted stuff finally. 1 War story and a war idea. Czech, ahem, I mean check them out. Other than that keep it coming! 1/17/00 Happy MLK day! I updated the tactics section by adding the concept of Dynamic movement. Hopefully I'll get some user-submitted tactics about anti-camping soon. 1/14/00 (No comment on Y2K) I'm alive, and I made a little update for you. Reviewed the SM5000, be sure to check it out. I'll get around to adding a guestbook soon, but until then my e-mail's there. Also the promised pictures of tactics are something I'm contemplating, if you're interested, just tell me and I'll know somebody even cares. Also I might add some polls or something as well. Other than that, send in suggestions on what you think my page should have, barring all the current press releases from Hasbro. In my opinion tactics should be the beef of a page b/c there are too many people who just review guns and call it a decent nerf page (cough) Stryker. I review guns simply because guns don't win wars . . Unless you use the right ones. 11/10/99 Alright, the reason I haven't been updating is because for my wild update spree I got nearly no hits, say around 30 a day. If you want me to update this page Tell your friends about it, link to me, plug, whatever. Also, feedback is nice. I will accept almost anything user-submitted as long as it's appropriate and I feel it's a good addition. Even if you just want to tell me what you think of my page, go ahead and mail me, I changed to yahoo so now I have POP access. Ok, now I'll tell ya what I did. I updated and refined my wars section with actual war ideas and a revised hit system. 10/3/99 I made a huge update to the sniping tactics section. Also some may have noticed that I fixed my counter. The update on sniping includes words on concealment and what to do when it all hits the fan. 9/25/99 Woohoo! I finished it. Here it is. The very first and to my knowledge only Nerf Role-Playing Game. It's kind of in beta stage so comments and suggestions would be appreciated. 9/25/99 Alright I've added a new section that is to my knowledge unique in Nerf pages. It's called Vs. and the explanation is on the page. Another section might be coming as well. No hints though. 9/21/99 Ok here it is, a new SECTION. I've added a combo page and plan to add yet another section. Also I added a review of the Airzone Ten shooter and updated my 6-shooter review with the discovery that mini-darts work. 9/11/99 I fixed my modified crossbow using the spring from my Defender! I'll bet I can hit YOU from here with it (j/k I don't think I'm that good at mods). I fixed a grammatical(?) error in the opening story. Also in the future I might add a new section (BIG SECRET) and possibly making some lousy pictures of some tactics. Don't hold your breath though. I have school, music, sports, and my fully operational modified crossbow. 9/6/99 Ok, I'm just telling you guys a few things. First, I made a blow gun out of plastic PVC and it shoots the new laramis nearly as far as the modified crossbow (if you use it right). It's accurate too. Also I am searching out replacement parts for my modified crossbow and I dropped Nerf a line. I also suggested they re-release guns like the arrowstorm, chainblazer, and crossbow (applause :-P). Just in case somebody hasn't already. 9/1/99 Uhh, I added 1 LINK! I would also like to comment that I wouldn't mind hearing from some of the people visiting my page, especially about the counter cuz I'm too stupid to get a new one. 8/18/99 Well, it looks like you bums broke my counter :-P. I haven't updated it yet because nobody was reading it. Obviously somebody has looked at this page so I'm going to do a little updating. I haven't fixed that counter yet but I'll get around to it. I added 2 new gun reviews, a war story, and a partridge in a pear tree- I mean updating the sniping tactics section under tactics. 7/6/99 Just got this page up, I will hopefully make this page more graphically pleasing soon and get some user-submitted things like war stories, modifications, tactics and everything else important to a Nerf Warrior! I also want to put up a guestbook and a counter A.S.A.P. Well, here’s the index of my page. You can contact me at cfalr@netscape.net. Also, I'd probably get it sooner if you mailed me at ia_mc@yahoo.com. All material on this page except the gun images is my original work unless otherwise stated. If you decide to use any of my info on your page, please say where you got it from. times since 9/6/99. That's gotta hurt.